The following is an excerpt from Working Stiff: Two Years, 262 Bodies, and the Making of a Medical Examiner, by Judy Melinek, MD and T.J. Mitchell. Plus, see if you can solve this real-life medical mystery. “Remember: This can only end badly.” That’s what my husband says anytime I start a story. He’s right. So. This carpenter is sitting on a sidewalk in Midtown Manhattan with his buddies, half a dozen subcontractors in hard hats sipping their coffees before the morning shift gets started. The remains of a hurricane blew over the city the day before, halting construction, but now it’s back to business on the office tower they’ve been building for eight months. As the sun comes up and the traffic din grows, a new noise punctures the hum of taxis and buses: a metallic creak, not immediately menacing. The creak turns into a groan, and somebody yells. The workers can’t hear too well over the diesel noise and gusting wind, but they can tell the voice is directed at them. The groan sharpens to a screech. The men look up—then jump to their feet and sprint off, their coffee flying everywhere. The carpenter chooses the wrong direction. With an earthshaking crash, the derrick of a 383-foot-tall construction crane slams down on James Friarson’s head. “How did it happen?” my husband, T.J., wanted to know when I got home. He winced. “I mean, how come it toppled over?” We were at the small playground downstairs from the apartment, watching our toddler son, Danny, arrange all of the battered plastic trucks and rusty tricycles in a line, making a train. “It doesn’t happen that often, believe me.” Our raised voices had drawn the attention of the other parents on the bench. “Civilians,” T.J. warned under his breath, reminding me that no one on a playground full of preschoolers wanted to hear our discussion of a grisly workplace accident. “Did he have a wife, kids?” he asked quietly. My husband looked at me askance. I’m not a ghoulish person. I’m a guileless, sunny optimist, in fact. When I first started training in death investigation, T.J. worried my new job would change the way I looked at the world. He feared that after a few months of hearing about the myriad ways New Yorkers die, the two of us would start looking up nervously for window air conditioners to fall on our heads. Maybe we’d steer Danny’s stroller around sidewalk grates instead of rolling over them. We would, he was sure, never again set foot in murderous Central Park. “You’re going to turn me into one of those crazy people who leaves the house wearing a surgical mask and gloves,” he declared during a West Nile virus scare. Instead, my experience had the opposite effect. 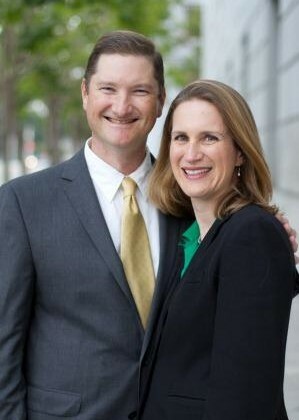 It freed me—and, eventually, my husband as well—from our six o’clock news phobias. Once I became an eyewitness to death, I found that nearly every unexpected fatality I investigated was either the result of something dangerously mundane, or of something predictably hazardous. So don’t jaywalk. Wear your seat belt when you drive. Better yet, stay out of your car and get some exercise. Watch your weight. If you’re a smoker, stop right now. If you aren’t, don’t start. Guns put holes in people. Drugs are bad. You know that yellow line on the subway platform? It’s there for a reason. Staying alive, as it turns out, is mostly common sense. Mostly. As I would also learn at the New York City Office of Chief Medical Examiner, undetected anatomical defects do occasionally cause otherwise healthy people to drop dead. One-in-a-million fatal diseases crop up, and New York has eight million people. There are open manholes. Stray bullets. There are crane accidents. “I don’t understand how you can do it,” friends—even fellow physicians—tell me. But all doctors learn to objectify their patients to a certain extent. You have to suppress your emotional responses or you wouldn’t be able to do your job. In some ways it’s easier for me, because a dead body really is an object, no longer a person at all. More important, that dead body is not my only patient. The survivors are the ones who really matter. I work for them too. I didn’t start off wanting to be a forensic pathologist. You don’t say to yourself in second grade, “When I grow up, I want to cut up dead people.” It’s not what you think a doctor should do. A doctor should heal people. My dad was that kind of doctor. He was the chief of emergency room psychiatry at Jacobi Medical Center in the Bronx. My father instilled in me a fascination with how the human body works. He had kept all his medical school textbooks, and when I started asking questions he would pull those tomes off their high shelf so we could explore the anatomical drawings together. The books were explorers’ charts, and he moved with such ease over them, with such assurance and enthusiasm, that I figured if I became a doctor I could sail those seas with him. I never got the chance. My father committed suicide at age thirty-eight. I was thirteen. People kept coming up to me during his funeral and saying the same thing: “I’m so sorry.” I hated that. It roused me out of my numbness, to anger. All I could think to say was, “Why are you saying you’re sorry? It’s not your fault!” It was his fault alone. My father was a psychiatrist and knew full well, professionally and personally, that he should have sought help. He knew the protocol; he had asked his own patients the three diagnostic questions all of us learn in medical school when we believe someone is having suicidal ideations. First, “Do you want to hurt yourself or kill yourself ?” If the answer is yes, then you are supposed to ask, “Do you have a plan?” If again the patient answers yes, the final question is, “What is that plan?” If your patient has a credible suicide plan, he or she needs to be hospitalized. My father’s suicide plan was to hang himself, an act that requires considerable determination. After he succeeded in carrying out that plan, I spent many years angry at him, for betraying himself and for abandoning me. Today, when I tell the families and loved ones of a suicide that I understand exactly what they’re going through—and why—they believe me. Many have told me it helps them come to terms with it. Over the years some of these family members have continued to call me, the doctor who was on the phone with them on the single worst day of their lives, to include me in the celebration of graduations, weddings, new grandchildren. You miss the person who was taken away from you most deeply during the times of greatest joy. Getting those calls, thank-you cards, and birth announcements—exclamation marks, wrinkled newborns, new life—is the most rewarding part of my job. This personal experience with death did not cause me to choose a profession steeped in it. My dad’s suicide led me to embrace life— to celebrate it and cling to it. I came to a career performing autopsies in a roundabout way. When I graduated from UCLA medical school in 1996 I wanted to be a surgeon, and I began a surgical residency at a teaching hospital in Boston. The program had a reputation for working its surgery trainees brutally; but the senior residents all assured me, conspiratorially, that the payoff outweighed the short-term cost. “You work like a dog for five years. Tough it out. When you’re done and you become an attending physician, you’ve got it made. The hours are good, you save lives all day long, and you make a lot of money doing it.” I bought the pitch. Before long I started noticing that many of the surgeons’ offices had a cot folded away in a corner. “Who keeps a bed in his office? Somebody who never has time to go home and sleep, that’s who,” a veteran nurse pointed out. My workweek started at four thirty on a Monday morning and ended at five thirty Tuesday evening—a 36-hour shift. A 24-hour shift would follow it, then another 36, and the week would end with a 12-hour shift. I got one full day off every two weeks. That was the standard 108-hour work schedule. Sometimes it was worse. On several occasions I was wielding a scalpel for 60 straight hours relieved only by brief naps. I clocked a few 130-hour workweeks. T.J. started buying lots of eggs, red meat, protein shakes, boxes of high-calorie snack bars he could stick into the pockets of my lab coat. He had to cram as much fuel into me as he could during the predawn gloom of breakfast, and again when I dropped into a chair at the dinner table, still in my dirty scrubs, the following night. During my fifteen-minute commute home, I’d often take catnaps at red lights—“I’ll just close my eyes for a minute”—and wake to the sound of the guy behind me laying on his horn, the light green. Boston is T.J.’s hometown. His family was overjoyed when we moved back there from Los Angeles. We were eighteen when we started dating—college freshmen, practically high school sweethearts—and had entered our twenties happy, and serious about each other. I wanted to get married—but he had begun to have his doubts. He doubted, I would later find out, that he wanted to be married to a surgeon. I was fading into a pallid, shuffling specter and was steadily losing the man I loved, and who loved me. Then, one day in September, I fainted on the job at the end of a thirty-six-hour shift. I dropped to the linoleum right next to a patient in his sickbed and awoke on a gurney being wheeled to the emergency room, an intravenous glucose drip in my arm. The diagnosis was exhaustion and dehydration. The head of the residency program, my boss, came in and stood next to the IV drip bag, obviously impatient but not visibly concerned. “Okay,” he said, “you’re just tired. Go home, take twelve hours off, and sleep. Drink plenty of fluids, all right?” I was in a daze, wiped out and ashamed, and could only nod back. “I’ll get somebody to cover your next shift,” the surgeon told me, his back to my bed as he hurried out the door. As soon as the boss had left me alone in that ER bed, I was no longer ashamed. I was infuriated. Nobody should be expected to practice clinical medicine, much less perform surgery, on the three hours’ sleep I had been living with. But I had wanted to be a surgeon since I first picked up a scalpel in medical school. I had been in the operating room and watched lives saved, and wasn’t ready to give it up just because my body gave out on me one time. I went back to work. Hyperal, short for hyperalimentation, is a type of intravenous nutritional supply that puts food energy directly into your bloodstream. It has to include a carefully calibrated number of insulin units—fifteen or twenty units, for instance—so that your body can maintain its healthy cycle of fuel storage and release. If instead you were to receive two hundred units of insulin, you would pass out from hypoglycemia and die within minutes of a fatal cardiac arrhythmia, a terminal seizure, or both. “Melinek. Let’s see.” There was a shuffling of papers on the other end of the line. “No,” the woman finally replied, and I was able to breathe again. “Right,” confirmed the pharmacy technician, who had just saved somebody’s life. The doctor who wrote that order during the last shift was a fellow surgery resident. He had almost killed a patient by writing an extra zero on a nutrition order. I didn’t fill out an incident report about the near-fatal mistake. Nobody had been hurt and nobody had died, so there was no incident. During one of those 130-hour workweeks, had I hurt patients without even knowing it? Had I killed anyone? The end of my surgical career came three months later, when I caught the flu—ordinary seasonal influenza—and tried to call in sick. “There’s no one to take up the slack this time,” my boss scolded, as though my trip to the hospital ER in September had been some sort of shirking ploy. I swallowed two Tylenol, stuck the rest of the bottle in my pocket, and went to work. The shift was a blur. The Tylenol wore off after a couple of hours, and I started shaking with chills. I took a moment to slip into an empty nurses’ alcove and measure my temperature: 102º. While I was gulping two more pills, an emergency came through the door, a young woman with acute appendicitis. Somebody thrust the medical chart in my hand as I followed the gurney down to the operating room. The patient’s fever was 101.2º—lower than mine. More than a year later, I called her to ask if she knew of any pathology jobs, anywhere, for a failed surgery resident. “Can you start here in July?” she asked. Even more shocking was T.J.’s enthusiasm for the idea. “You’ll be leaving your family behind again,” I pointed out. 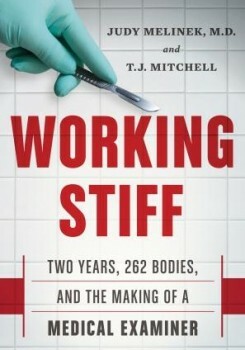 Excerpted from Working Stiff: Two Years, 262 Bodies, and the Making of a Medical Examiner, by Judy Melinek, MD and T.J. Mitchell. Copyright © 2014 by Dr. Judy Melinek and Thomas J. Mitchell. Reprinted by Permission of Scribner, a Division of Simon & Schuster, Inc.
*This post’s headline was updated on August 8, 2014 to properly reflect the forensic pathology industry. Judy Melinek is a forensic pathologist, author of Working Stiff: Two Years, 262 Bodies, and the Making of a Medical Examiner (Scribner, 2014), and assistant clinical professor of pathology at the University of California, San Francisco in San Francisco, California.